Connect your favorite passive speakers to your Sonos ecosystem with the Sonos Amp 2.1-Channel 250W Power Amplifier. It connects to a pair of stereo speakers and a subwoofer, delivering up to 125W per channel thanks to its Class-D amplifiers. It connects to your home network via Ethernet or 802.11b/g/n Wi-Fi, to an audio source via RCA, and to your compatible display via HDMI ARC. The Amp can be controlled via the Sonos app, which is required for setup. With its 125W per channel output, the Amp can provide sound to your outdoor, bookshelf, floorstanding, or architectural speakers. An auto-detecting subwoofer output is also onboard. The Amp works with over 100 streaming services, so you can enjoy whichever ones you prefer. It also has an HDMI ARC input to connect your compatible display, plus a stereo RCA line-in for connecting your turntable or other audio source. Over 100 streaming services are supported, as well as AirPlay 2, so you can listen to the music, audiobooks, podcasts, radio stations, videos, and more from your favorite apps. The Amp can integrate with select third-party devices for both source audio and control. Use the Sonos app, AirPlay 2, your universal remote, the touch controls on the Amp, or your voice with your compatible smart device to control the Amp. The Amp fits in standard racks and can be wall-mounted. It also features a simplified set of connections for a neat-looking aesthetic. The direct digital input eliminates the need for analog conversion to help provide undistorted sound for music streaming and TV. The Sonos app will walk you through setting up the Amp with step-by-step instructions and help you customize your system. The app also stores all your streaming services and room controls together in one place. If you prefer a wired-only connection, you can turn Wi-Fi off in the Sonos app. In the Sonos app, you can configure the Amp to output in either stereo or dual mono to suit your preference. The threaded speaker connections can be removed so you can use your own banana plugs. With a centralized heat sink and air inlets, the Amp keeps its cool without the noise of a fan. Adjustable bass and treble controls let you adjust your sound performance. Volume can be adjusted by individual rooms or groups of rooms. With two Ethernet ports, you can connect the Amp to a wired home network and use the second port to connect an additional Sonos device. New features, voice assistants, services, and API integrations can be added at any time. Additionally, you can connect Sonos speakers over Wi-Fi for listening in more rooms. 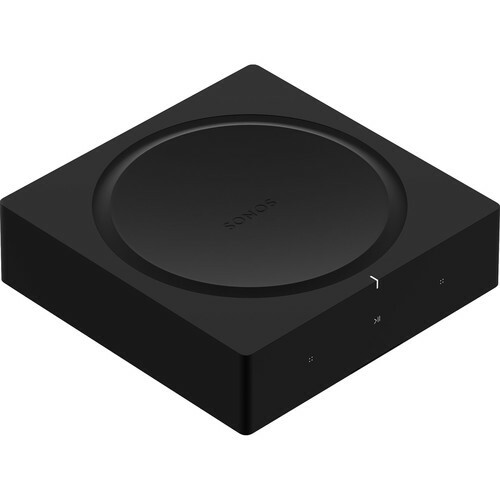 802.11n-only network configurations are not supported; you can either change the router settings to 802.11b/g/n or connect a Sonos product to your router. Box Dimensions (LxWxH) 13.2 x 11.45 x 4.8"